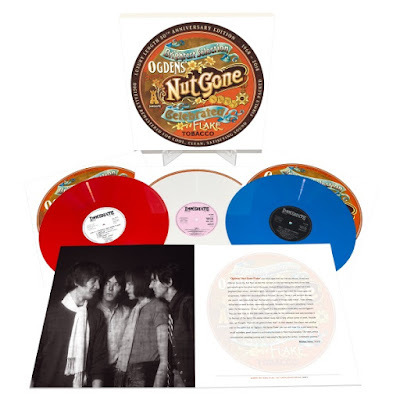 Immediate Records and Charly Records are to celebrate the 50th Anniversary of the Small Faces' much loved third album “Ogdens' Nut Gone Flake” with the release of a variety of new and very special deluxe editions across various formats (including deluxe triple 180-gram red, white & blue coloured vinyl LP box-set and a comprehensive 3CD+1DVD yearbook set) on 26th October 2018. The 180-gram vinyl LP formats have been newly mastered at half-speed for optimum sound quality and pressed in conjunction with Optimal: Media in Berlin and The Vinyl Factory in London from restored original Immediate Records tape sources. Originally recorded during 1967 and 1968 by Glyn Johns at Olympic Studios, Trident and Pye Studios, the expanded editions of “Ogden's’’ also feature rare material from the archive of surviving Small Faces member Kenney Jones. All editions have been prepared under the watchful eye of Small Faces reissue producer and Immediate Records label manager Rob Caiger with remastering engineer Nick Robbins (Soundmastering Ltd) and vinyl cutting engineer Matt Colton (Alchemy Mastering) and approved by Kenney Jones. Mastering Engineer Of The Year Award winner 2018, Matt Colton explains the half-speed cutting process to produce a 33 1/3 rpm LP: “Cutting at half-speed offers a better transient and dynamic response, more defined and accurate sound, extended low frequency, and smooth high frequencies. LP2 features the album's original stereo mix, whilst LP3 boasts a plethora of rare tracks released for the very first time on vinyl, all providing a fascinating snapshot of this key period in the acclaimed British band's career. All editions have been assembled by Grammy-Award winning graphic designer Rachel Gutek who has had access to the Immediate Records original artwork files. 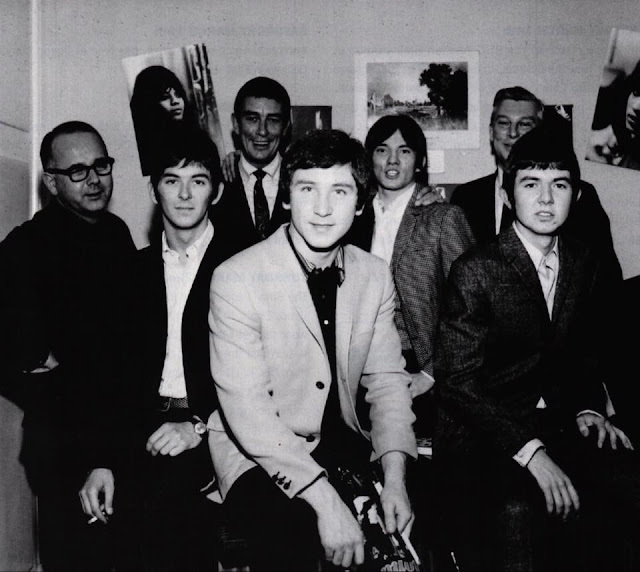 The Small Faces story starts in July 1964 with vocalist & guitarist Steve Marriott, bassist Ronnie Lane and drummer Kenney Jones all sharing a bill at the Albion in Rainham, Essex as part of their own respective bands. Marriott, Lane, and Jones met up again months later in a local music shop - the J60 Music Bar - and struck up a conversation whereby they discovered a shared love of American blues and R’n’B. Marriott was invited to play live with Lane & Jones' that evening in Bermondsey but following a particularly rowdy show where Marriott smashed up the venue's piano, they were sacked and ended up planning a new band together - the beginning of the Small Faces. The band's rise was stratospheric, with the new group playing their first out of town show at Peter Stringfellow's Mojo Club in Sheffield in July 1965, accepting a residency in London's Cavern Club in Leicester Square and signing with heavyweight manager Don Arden before releasing a debut single, “Whatcha Gonna Do About It,” on Decca Records in August, which quickly ascended to No.14 in UK Singles Chart. 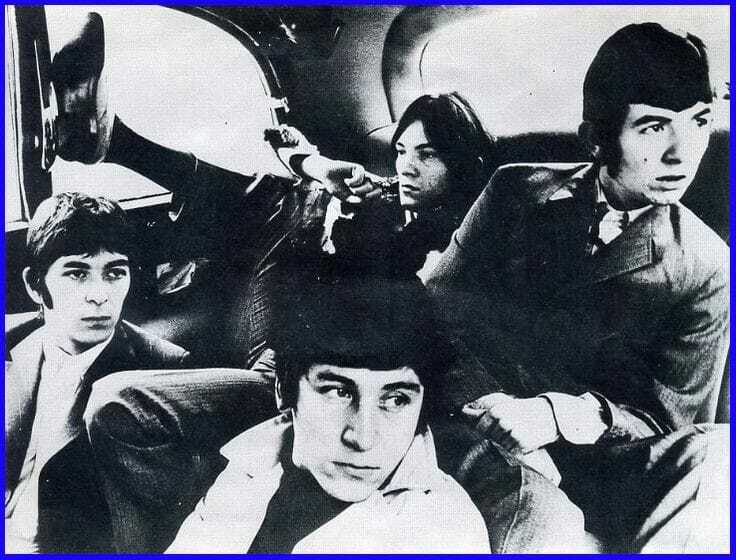 When third single “Sha-La-La-La-Lee” reached No.3 five months later and their eponymously-titled debut LP also reached No.3 in the UK in the summer of 1966 (and with original keyboard player Jimmy Winston leaving the band at this point to be replaced by Ian “Mac” McLagan), the Small Faces had truly arrived. Acrimoniously splitting from manager Don Arden, the band made an inspired move when they signed to Andrew Loog Oldham's Immediate stable in February 1967. Oldham saw Marriott/Lane as the obvious replacements for the Jagger/Richard songwriting team that had thus far helped afford the fledgling record label its insouciant cool (and big hits). Liberated by the move to their new independent confines, the band could now completely spread their wings; releasing a well-received, accomplished first LP (again entitled “Small Faces”) for Immediate in June 1967, also finding the time to reflect that summer’s psychedelic reverberations two months later via non-album Top 3 hit single, “Itchycoo Park,” before finally blasting it out of the park in December 1967 with the astonishing single “Tin Soldier,” their first collaboration with newly-signed Immediate label mate P.P. Arnold. The band was at something of a strange juncture as they entered Olympic Studios, London with engineer Glyn Johns in late-1967 to commence the recording of their third long-player. The credibility afforded 'rock' acts as opposed to those considered mere 'pop' was still of crucial importance at this time in British music history and, having already achieved four UK Top 10 singles in 1966 (including a No.1 hit with the mighty “All Or Nothing”) plus three Top 10 singles in the first few months of 1967, the pressure was now somewhat on to make that leap to timeless authenticity by delivering a truly great album. 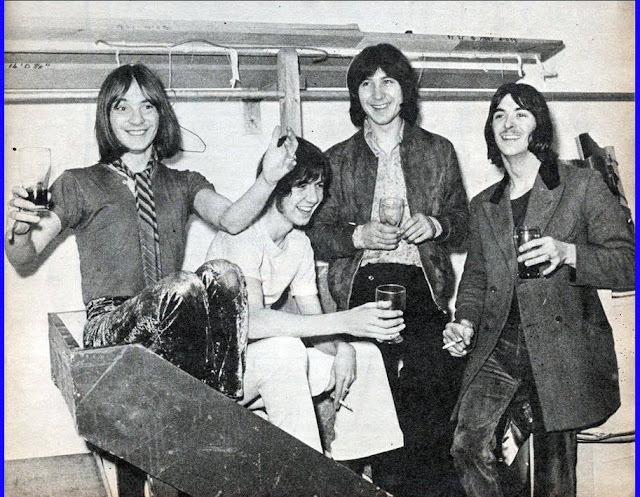 To add to the pressure, Immediate Records was suffering cash flow problems, inter-band relationships had become strained following a period of extensive overseas touring with The Who and the band's frontman Steve Marriott was constantly questioning the group's place in the musical firmament. 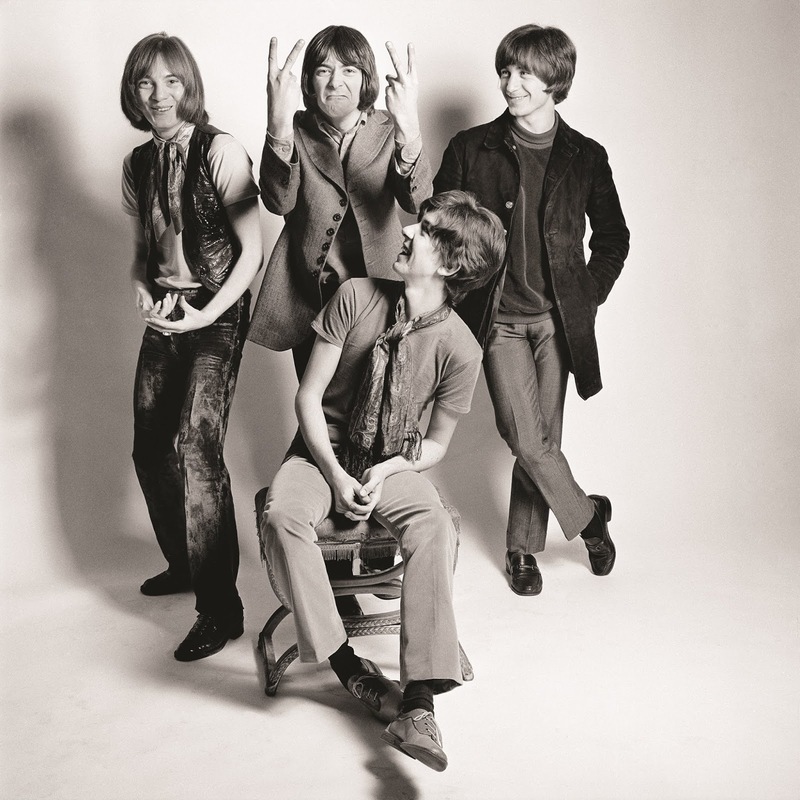 The decision was made to stop touring and give the band time to write a bigger record - the four musicians spent February 1968 working up tracks on three different boats cruising up and down the Thames, studio time was unlimited and the band members also took the opportunity to relocate to the countryside from the inner city, a new domestic scene perfectly captured in Andrew Loog Oldham's choice of first single from the forthcoming album, “Lazy Sunday” (Steve Marriott had wanted to release the heavier “Song Of A Baker” with “Lazy Sunday” as the B-side, but Loog Oldham stuck to his guns). Having rowed with a member of The Hollies, both accusing the other of never singing in their own natural accents, Marriott quite deliberately ramped up his vocal cockney tones on the single which reached No.2 on its release in April 1968. 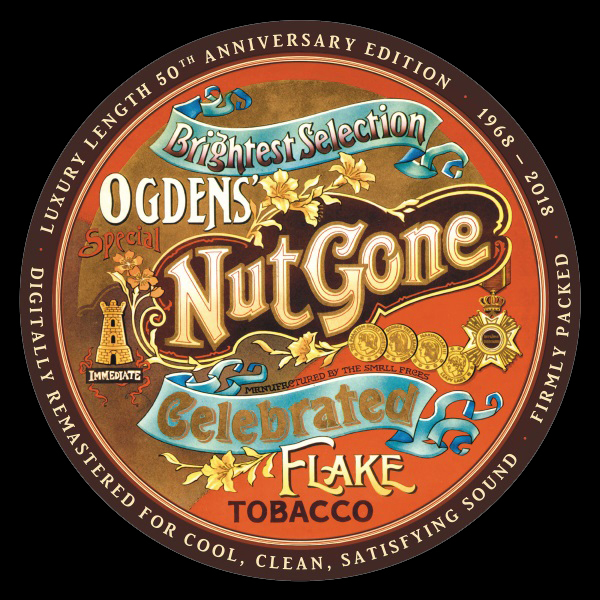 The Small Faces' third studio album, “Ogdens’ Nut Gone Flake,” was released by Immediate on 26th May 1968, soon sitting pretty atop the UK Album Chart where it enjoyed a six week reign at No.1 that summer. The LP was housed on its original release in a round circular sleeve featuring a replica of the Thomas Ogden metal tobacco tin that inspired the album’s title. “Ogdens’’ was a proper game-changer - a brave British psychedelic rock statement that oozed jaw-dropping rock, soul and R'n'B, played by four remarkable young musicians completely at the top of their game. Whilst side one dazzled with the sheer power of Ronnie Lane's “Song Of A Baker” and the heavy soul of Marriott's “Afterglow” (belatedly reworked into the band's final official studio single, “Afterglow Of Your Love”) plus a liberal dash of Cockney knees-up on aforementioned first single “Lazy Sunday” and “Rene,” the LP's second side premiered the band's six-song fairytale of Happiness Stan and his quest to find the missing section of the crescent moon, the six track cycle linked via narration by comedian Stanley Unwin, his words suitably twisted into odd shapes via his unique, surreal 'Unwinese' linguistics. “Ogdens' Nut Gone Flake” was the landmark album that the Small Faces had always threatened to make - both a critical and commercial highpoint and one that would finally afford them the real rock credibility that had thus far slightly eluded them. The album's whole was something truly psychedelic and new - at times almost childlike in its innocence, but at the same time infused with the band members' complex emotions and already slightly world-weary experiences. It seems incredible that this was a group a mere three years away from its humble beginnings in the sweaty East End pubs & R'n'B clubs of its birth. In addition to these new 50th Anniversary deluxe editions of “Ogdens' Nut Gone Flake” on 26th October 2018, surviving band member Kenney Jones has also recently published an acclaimed autobiography, “Let The Good Times Roll,” via Blink Publishing, writing extensively about his time drumming with the Small Faces, the Faces and The Who (amongst others), speaking openly about his own personal cancer battle and his continued work to raise awareness via the Prostate Cancer UK charity and his own Rock 'n' Horsepower charity events.